Vrrroooommmm! Hark! I think I hear a car. 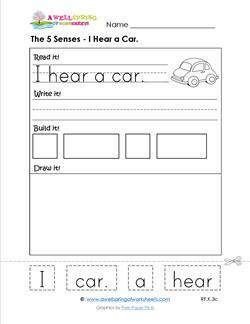 Yes, there is a familiar sound of a car here on this 5 senses worksheet. Can you hear it? Read, write, cut, glue and draw a car of your own. Whoooo! Whoooo! What do you hear? It's a big eyed owl looking at you! Try making the sound of an owl as you read, write, cut, glue and draw on this 5 senses worksheet. Where is that beautiful music coming from? It's coming from your imagination - a beautiful violin sound. 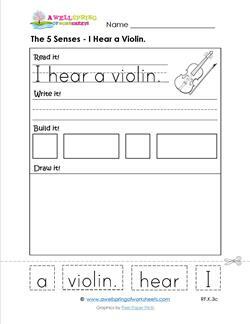 Read, write, build and draw the 5 senses sentence "I hear a violin". What shines brightly in the sky just after the rain? You've got it! A rainbow. In this 5 senses worksheet kids read the sentence "I see a rainbow", write it, build it, and draw a rainbow. The 5 Senses – I See Me! Mirror, mirror in my hand I'm the fairest in the land! 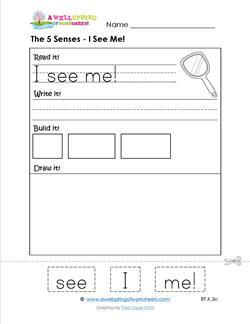 This 5 senses worksheet has kids thinking about seeing not only the world around them but themselves, too. I see the stars! Not the movie stars but the beautiful stars in the sky. 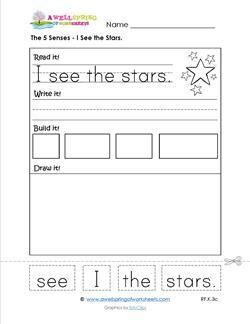 Have kids read the sentence "I see the stars. ", write it, build it, and draw their own stars. What smells lovely enough to wear as a perfume? The smell of flowers! 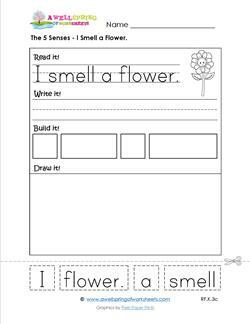 With this 5 senses read, write, build and draw worksheet kids get to think about how flowers smell. Pee-yew! Where is that stinky smell coming from? Take a look at the friendly guest on this 5 senses worksheet. It's a skunk for sure! Enjoy this page - even if you have to plug your nose! Crunch! There's nothing so great as biting into a fresh juicy apple! But with so many varieties, there's so many different tastes. 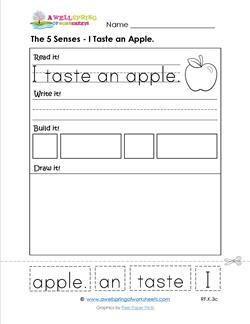 Kids read, write, build and draw "I taste an apple.". What is one vegetable kids just love, love, love the taste of? You got it - broccoli! (Yes, that was a joke.) 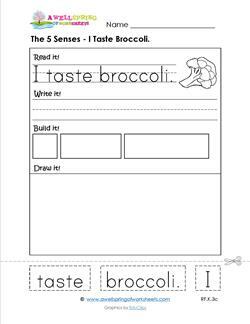 Anyway, kids can read, write, build and draw the sentence "I taste broccoli.". Kids love to learn about the 5 senses. Most kids like the taste of pizza ... depending on the toppings, of course. 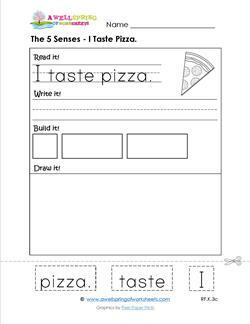 Have kids read, write, build and draw the sentence "I taste pizza.". It's a rare thing to be able to touch a real nest! What words would you use to describe how it feels? 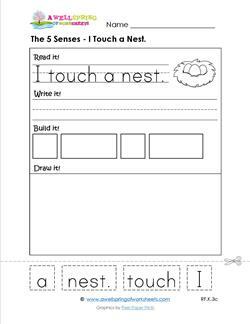 Kids can read, write, build & draw the 5 senses sentence "I touch a nest." How would kids use the 5 senses to describe how a rabbit feels as they pet it's back? They can read, write, build and draw the sentence "I touch a rabbit." while they think about it! Kids can imagine how a turtle's shell would feel just by looking at it. What descriptive words can they use? 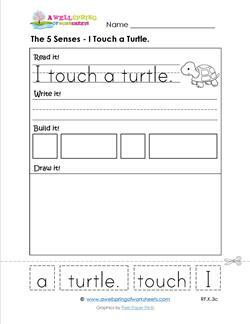 With this 5 senses worksheet they can read, write, build & draw "I touch a turtle. ".